Our attractive little book Sign Here! (publication date September 2018) takes a look at city, town and village signs that commemorate famous former residents of the London Borough of Bromley and its near neighbourhoods in Kent and London. A blue plaque is a permanent sign installed in a public place, to commemorate a link between that location and a famous person or event. Bromley has an abundance of very famous ex-residents whose connection to the area is made visible today not only by blue plaques but also by other types of memorials and displays. Sign Here! tells you many of their stories - with numerous amusing, informative and surprising little anecdotes! In and around Bromley you can see a splendid array of town and village signs many of which are recent arrivals in the New Millennium. Sign Here! recounts how these signs new and old usually depict an aspect of the local history and/or the flora & fauna or wildlife of the vicinity. Some of the signs are admirably clever and witty! - and attractive in design and effect. Sign Here! looks too at directional signs for motorists and pedestrians, heraldry and many other aspects and quirks of local commemorative monuments and signs. The book concludes with a short nostalgic tour of some of the Bromley district during the 1950s and 1960s. Photo: The audience at Hayes Village Hall on 12th June 2018 where members of Hayesara enjoyed Jerry Dowlen's illustrated talk on Blue Plaques featuring extracts from the Sign Here! forthcoming new book. [Hayesara is the Hayes Active Retirement Association]. 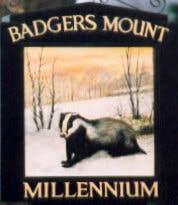 Cray 150 Publications partnered most successfully and enjoyably with Bromley Museum at The Priory. In 2011 we staged an exhibition that celebrated the 150th anniversary of Cray Wanderers FC - the oldest football club in London and the joint second oldest in the world. Then in 2013 in conjunction with Newlands Photographic we staged the 'Dove on the Wing' exhibition on the life of Donald Ward, poet and pacifist. There were so many excellent exhibitions by Bromley Museum at The Priory covering numerous arts and heritage topics that it is hard to keep count of them. A special highlight for sure was the illustrative work of former Orpington resident Stephen Chaplin who returned to display his eye-catching and evocative drawings of local incidents and scenes, some of them dating back to wartime in the 1940s. 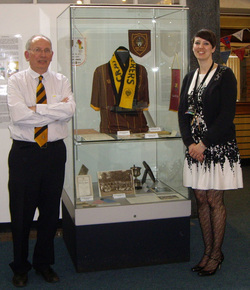 Photo: Jerry Dowlen co-author of 'Forever Amber' the history book of Cray Wanderers FC with Marie-Louise Kerr the curator at Bromley Museum in 2011.